More on The Fruitmarket website here. Foley Artist 1996 is a sound installation originally made for the artist’s exhibition in Tate’s Art Nowprogramme hosted by Tate Britain (in 1996, the Tate Gallery). Tacita Dean is fascinated by the technology and mechanics of film and this installation examines the way that sound is constructed for use in cinema. The title is a reference to the artistry of men and women who make such sounds as doors closing, cinema kisses and footsteps for cinematic post-production, known in the film industry as foley artists. The work comprises an eight-track cinema soundtrack that forms a narrative drama. Each track is relayed by one of eight speakers placed in different places and at different heights around the gallery space. A sense of movement around the room – footsteps or a car driving by in the rain – is created by appearing to pass the sounds from one speaker to another. Dean derived and amalgamated her sounds from a range of sources: wild recordings, specialist sound CDs, swaps with artistic colleagues and foley sounds. These elements of pure sound are counterbalanced by three objects, each of which contextualises sound as used in cinema. The most prominent, on an end wall, is a backlit box – an inversion of the customarily front-projected cinema screen – illuminating a dubbing chart. Like staves of an orchestral score, each of the eight tracks are notated separately in rows, one above the next. The fictional cinematic storyboard runs along the top. The drama of the work can be followed, literally, by reading the dubbing chart and listening to the sounds as they unfold. At the other end of the gallery, high on the wall, a video monitor shows the foley artists – Beryl Mortimer and Stan Fiferman – at work in a sound studio at Shepperton Studios, Surrey. 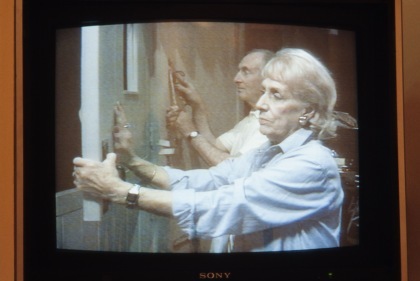 The artist intentionally prevents the foleys, working in real time on video, being viewed at the same time as the dubbing chart, a synthesis of sound production separated visually into its multi-track artificiality, by specifying that the video monitor and the light box should be mounted on opposite walls. Against a third wall stands a large, 16mm magnetic tape machine. It demonstratively asserts the mechanism through which analogue sounds, before the advent of digital technology, were stored and activated. The time element of the soundtrack unfolding is encapsulated by the tape spooling through the machine. Dean adds a further temporal element to Foley Artist by having her cinematic story framed by a performance of Shakespeare’s King Henry IV Part Two – its opening and closing lines come at the beginning and end of the five minute drama that is represented by sounds as diverse as a wet walk to the pub and a chase on a beach. To the real time of the foleys at work and the disjunctive cinematic time of the dubbing chart can thus be added the dramatic time of this imagined performance of a play. The notion of time – historical and present – is central to Dean’s work in film and in other media. She has acknowledged a fascination with and an attraction to old, even obsolete technology and things that are about to disappear. At the time she made Foley Artist, the foleys’ craft appeared to be under threat of extinction as a result of new digital technology which, in the end, proved unable to provide the depth of sound required, so that now foley sounds are regaining something of their former significance in cinematic production (Tacita Dean 2001, p.86). To evoke the nostalgia of traditional ‘real cinema’, she deliberately selected older foley artists to feature in the video part of Foley Artist, and it is also referred to by the sondor magnetic tape playback machine, which is a type used to dub analogue sound. As a continuation of her analysis of the physical characteristics of sound, Dean presented sections of the 16mm tape that feeds through the playback machine as measurements of such sounds as individual birdsong in her Magnetic series (1996–8), the length of each section corresponding to the length of time it takes to play a raven’s cry or a seagull’s call. In the same year that she made Foley Artist Dean traveled to De Voorst in the Netherlands to film the last waves being operated by a wave machine, footage of which became her film Delft Hydraulics 1996 (Tacita Dean2006, p.122). Her more recent film Kodak 2006 (T12407), shot in the last Kodak factory to make analogue film in Europe, similarly documents the final actions of nearly obsolete machinery. Other works focusing on sound include Trying to Find the Spiral Jetty 1997, a part fiction, part real recording of a journey to find Robert Smithson’s Spiral Jetty in Utah, USA, and Friday/Saturday – twenty-four hours of ambient sound recorded at eight places around the globe recorded from midday Friday to midday Saturday as the millennium changed from 1999 to 2000 that are usually presented as CDs in a jukebox.